"A customer once asked us to make a cocktail with every flu-busting ingredient we could find,' says Andrea. 'It's been modified over the years, but at its heart it is a hot, feisty little number, which is why we named it in homage to the rock band." 1. Put all the ingredients, except the ice, in a blender and blitz well. For a smooth drink, pass the blended liquid through a fine-mesh sieve. It is equally deliciou, and slightly spicier, not sieved with the chilli flecks remaining. 2. Put the ice in a shaker and add the liquid. Shake well to chill. 3. 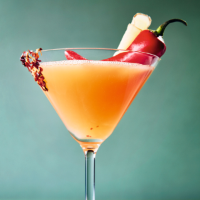 Moisten the rim of a large chilled martini glass with water and drip it in chilli flakes. 4. Pour the drink into the glass and garnish with a slice of fresh ginger and a chilli. Recipe by Catherine Salway and Andrea Waters, founders of London's Redemption, an alcohol-free restaurant-bar.